Saturday, August 4th 2012 was a happy day. 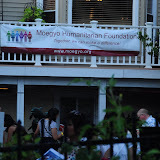 On that summer day, Moegyo Humanitarian Foundation held the 3rd Annual Lawn Concert in Herndon, Virginia, to raise funds to support 5 orphanages and Moegyo 1 Primary School in Shan State. There was live music by a local band and the guests enjoyed a dinner buffet complete with many authentic Burmese Cuisines, desserts and drinks. Local vendors displayed their goods for sale, and a silent auction featuring unique gifts and accessories. The event was possible with the help of supporters and volunteers who turned out to give a hand to those children in need in Myanmar. 100% proceeds from the event went towards the orphans in Myanmar.